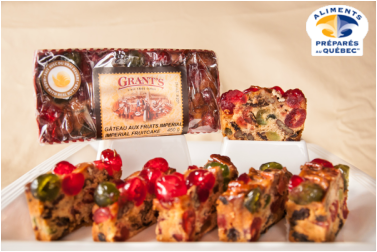 Our Deluxe fruitcake consists of top quality red and green glacé cherries, plump juicy raisins and golden glacé pineapple mixed with a rich, moist and flavorful batter to make up a 72% fruit content. This cake is one of our most delectable. Our recipe does not contain nuts or peanuts. Our 900g ring-style featured in the photo above. Supplementary packaging options are available. 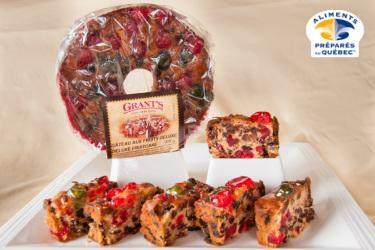 This fruitcake has just the right amount of pecans added to enhance our Deluxe cake. It consists of top quality red and green glacé cherries, plump juicy raisins and golden glacé pineapple mixed with a rich, moist and flavorful batter to make up a 72% fruit content. 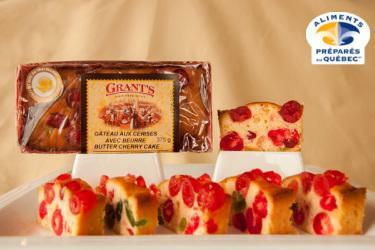 It is topped with red and green glacé cherries, golden glacé pineapple and pecans. This fine quality cake is a delight. The cake is available in a 450g loaf-style (as featured in the photo above). The decorative box makes this product a perfect gift idea. 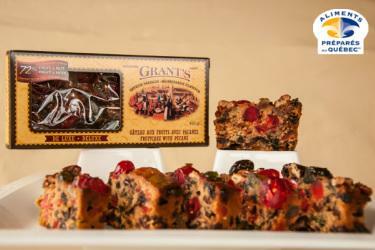 Our Imperial fruitcake is the ultimate quality fruitcake. It is comprised of only the highest quality red and green glacé cherries, plump juicy raisins, golden glacé pineapple and pecans mixed with a buttery, rich, moist and flavorful batter to make up a 65% fruit and nut content. This recipe contains lots of real butter. Our butter cherry cake is always made from top quality red and green glacé cherries and golden glacé pineapple mixed with a rich, buttery, moist and flavorful batter to make up a 55% fruit content. Delicious any time of year. 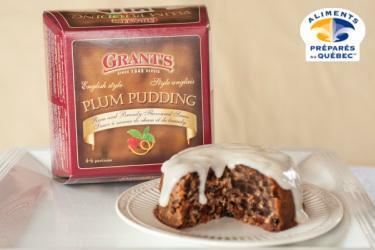 Our plum puddings are made from top quality raisins, red glacé cherries, assorted colored glacé rutabaga, currants, dates mixed in a batter flavored with minced orange & lemon peel, a blend of fine spices and apple juice concentrate, to make up a 50% fruit and vegetable content. 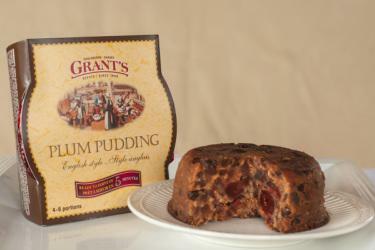 These puddings should be reheated and served with your favorite Christmas pudding sauce (4-6 servings).